Hello Friends! !Many times it happen with us that when we try to install some application on our phone then it shows 'certificate error' and don't allow us to install it. Well,today I'm gonaa solve this problem forever.With this trick you can always bypass this certificate error because we are going to generate permanent certificate.Yes....Here i am posting trick to fix expired certificate error.I am downloading most of applications from internet.Some times application[software/games] shows “expired certificate error” during installation.So Dont waste time to download that application from different sites or dont think that something os problem with your phone.you dont need to flash or upldate your mobile. 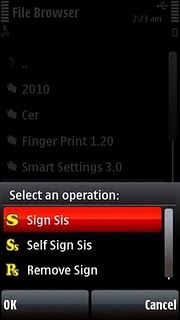 Here i have come with solution to install unsigned application.Read this article and Enjoy .Free Signer is a mobile application that helps you sign your unsigned symbian applications which makes it able to bypass the security restrictiom placed on unsigned apps. You first need to get a valid certificate and key to get this done. 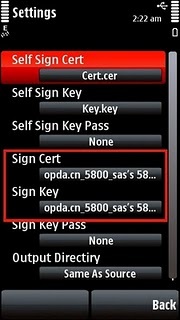 How to use ‘FREE SIGNER’? 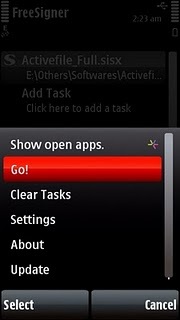 In the new panel Click Options–>Go!. Done..!! · Lastly when you sign any app do not click on the option ”self sign sis” click on ”sign sis”I have one more trick to solve expired certificate error.i will post it soon.If you like this article then;Share this article on facebook.. Enjoy anddon't forget to comment here.